Fawad Khan is having the best time in India. Apart from being the first Pakistani actor to take the Filmfare Award For Best Debut home and being the first ever Pakistani celebrity to host IIFA Awards, people in India are so obsessed with the heartthrob that Zindagi TV, an Indian channel that exclusively airs popular Pakistani content has initiated the Fawad Khan festival which will run for almost a month, from July 9 to August 7. According to Dawn Images, on the agenda is lots and lots of re-runs of his hit TV serials – Numm, Zindagi Gulzar Hai and no points for guessing, Humsafar. Humsafar will air on Saturday 9th July and Sunday 10th July, Zindagi Gulzar Hai will air on Sunday 17th July and Sunday 24th July and Numm will air on Sunday 31st July and Sunday 7th August. As a special Eid treat, Zindagi will air his Bollywood debut flick, Khoobsurat. 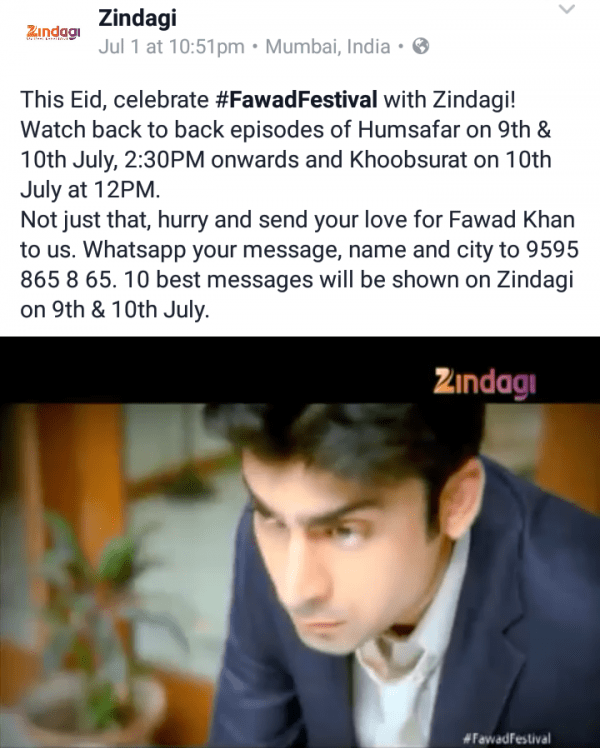 If that wasn’t enough, there’s also a #FawadFestival contest, where viewers will send their love to the heartthrob through a special Whatsapp contest.